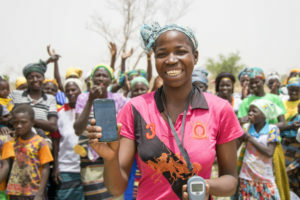 In rural places like Iringa District, Tanzania; Chipata, Zambia; or Boudry, Burkina Faso, USAID’s Mobile Applications to Secure Tenure – referred to as MAST – are helping smallholder farmers achieve greater security over their land. In Zambia, for example, USAID has been working with a local civil society organization, the Chipata District Land Alliance, to help chiefs and hundreds of villagers document and certify their land. This has translated into improved perceptions of tenure security – particularly for female-headed and poor households, as indicated through a randomized control trial impact evaluation. Now, USAID’s Land Technology Solutions Project (LTS) is providing a suite of integrated support services to USAID Missions to promote and scale the use of MAST worldwide. LTS services focus on meeting the needs and interests of USAID Missions and their implementing partners to achieve host country strategic development objectives, including those outlined in the Global Food Security Strategy, the USAID Gender Equality and Women’s Empowerment Policy, and the USAID Biodiversity Policy. What are USAID’s Mobile Applications to Secure Tenure (MAST)? MAST is a suite of innovative mobile technology tools and methods that help communities efficiently, transparently, and affordably map and document their land and resource rights. MAST works through easy-to-use mobile phone applications that empower people to document their own land and resources and to understand their rights. It combines these applications with a robust data management platform to capture and manage land information. This can include names and photos of the people using and occupying land, details about what the land is used for, and information regarding an occupant’s claim to the land. LTS can provide on-the-ground training on MAST to build capacity of communities to document and manage information about their land and resource rights. Training focuses on participatory approaches that ensure communities understand those rights. MAST’s easy-to-use mobile phone applications and participatory approaches empower local communities, especially vulnerable populations, to clarify their land and resource rights. Doing so, in turn, directly supports key USAID strategic priorities on economic growth, conflict prevention, and food security. Secure land tenure and property rights create incentives that increase long-term investments and boost food security, agricultural productivity and natural resource management. 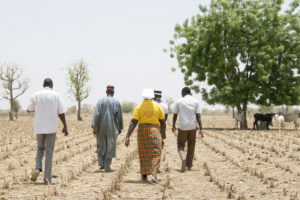 In rural Benin, for example, households that participated in a process to map their land rights had improved tenure security and shifted their focus from subsistence crops to long-term and perennial cash crops. In Ethiopia, the participatory documentation of land rights was found to increase investment in soil and water conservation, which could contribute to improved agricultural productivity and reduced environmental degradation. MAST is a proven, effective tool to strengthen land rights and generate these benefits. In Zambia, USAID’s Tenure and Global Climate Change Program is linking MAST with traditional community engagement practices. These include participatory mapping and support to village governance structures, and improved land-use planning by marrying community information with government records through multi-stakeholder dialogue. Initial impact evaluation findings from USAID’s randomized control trial in Zambia indicate that the MAST intervention has had a significant and strong effect on perceived tenure security, particularly for female-headed and poor households. These households reported to feel more confident that they could leave their fields fallow longer without threat of encroachment or reallocation. The USAID Feed the Future Tanzania Land Tenure Assistance Activity is expanding tenure security with MAST technology. Their approach builds off a successful pilot project, which tested an approach for the mapping of land parcels for rural adjudication, which culminated with the delivery of Certificates of Customary Right of Occupancy (CCROs). To date, over 11,500 parcels have been mapped, and approximately 250 CCROs are being registered per day, with about 4,000 CCROs fully processed. MAST pilot participants in Tanzania, especially women, expressed that they had knowledge of key legal processes as a result of MAST intervention and that they felt that they were less likely to wrongfully lose their land. Other participants noted that they were planning to invest in cash crops. As part of the LTS Project, the MAST Learning Platform, was launched on the LandLinks website. The MAST Learning Platform is an interactive knowledge management portal that brings together tools, technical documentation, software code, demos, and lessons learned from the implementation of MAST worldwide. Through the MAST Learning Platform, users can access details and lessons learned from current or past MAST projects in Tanzania, Burkina Faso, and Zambia. They can also access guides on how to use the MAST technology and invoke participatory approaches in project design and implementation. The MAST platform features an interactive demonstration of the MAST application used in Tanzania so users can explore how the mobile application functions to inventory and document land information. Users can also find data, access the MAST software code, or even contribute to the MAST software development on Github. The MAST Learning Platform is anticipated to become a living resource and will feature regular updates and contributions from MAST users and projects. The three-year LTS project was specifically designed to support the expansion of MAST into new countries. The LTS project offers a variety of services to USAID Missions and their partners. These include assessments to support the rapid deployment of MAST, design of pilot projects, and training to build capacity at the local, regional and national level in the use of MAST or related land technology solutions. To learn more, see the LTS Fact Sheet or visit the MAST Learning Platform. To access LTS services, please contact Ioana Bouvier, USAID E3 Senior Geospatial Analyst and LTS Contracting Officer’s Representative (COR) at ibouvier@usaid.gov or Stephen Brooks, Alternative COR, at sbrooks@usaid.gov.